The Police Command in Lagos State said investigation had commenced to fish out hoodlums that allegedly stoned an official of the state’s Kick Against Indiscipline Brigade to death. The Command’s Spokesperson, ASP Olarinde Famous-Cole, said that investigation had started immediately and perpetrators would be brought to book to serve as deterrent to others. “Investigation had commenced on the case and the command would not relent until the perpetrators were arrested,” he said. 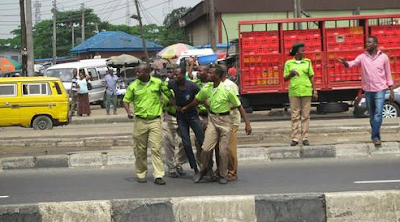 An official of the Lagos State KAI Brigade was reportedly lynched by street hawkers at Iyana-Oworo area of Lagos on Tuesday. The victim, Moshood Ayeni, was said to have been lynched when he apprehended a trader who was hawking in traffic.Other hawkers then mobilised and attacked the vehicle of the KAI Brigade. Spokesperson of the brigade, Alabi Rahmat, said the law enforcement environmental sanitation officials were on their way back to office when they saw the traders and tried to enforce the law. She narrated that “The officials were coming from an assignment when they saw traders hawking in traffic by car wash and arrested Jeremiah Nnana and Orich Nwofokoh, both selling sausage and phone accessories in the traffic. “The suspects were then taken into the agency vehicle with registration number KRD 643 DS and suddenly, the suspect’s colleagues, who escaped when the two were arrested, came back and pelted the officials with stone. “The traders started shouting and calling the KAI officials — thieves, thieves. The victim was said to have been rushed to the State Emergency Centre, where he was revived and later referred to the Lagos University Teaching Hospital where he was pronounced dead on arrival. Mr Jimoh Amusa, the KAI Marshal General, a retired Chief Superintendent of Police, condemned the barbaric act. Amusat said the victim was only doing his lawful duty when the hawkers attacked him. He, however, said the brigade would not be deterred in combating the menace of the illegal highway traders and hawkers within the state metropolis and commiserated with the victim’s family. The victim’s remains have been deposited at mortuary.